It never fails. I'm rushing out the door late to work and I can't find my keys or my wallet—and sometimes my smartphone. It's as if gremlins hid everything during the dead of night, though it's more likely the work of my kids in the case of my smartphone. That's where tracking devices come in. All you have to do is adhere a small tracking device tag on an item you habitually lose: your phone, the remote, the dog. Then, when it goes MIA, you can use either your smartphone or a locator unit to signal the tag to beep or flash a small LED light to signal its location. There are two basic types of finders: Radio Frequency (RF) and Bluetooth. RF finders use a dedicated fob for tracking your devices, while Bluetooth finders work through an app on your smartphone. The range is about the same (30-100 feet, depending on the device and conditions), though you get more features with the Bluetooth tags. 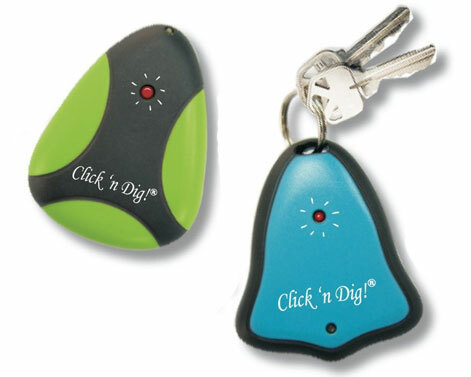 The popular Click ‘N Dig tracking device runs on radio frequencies (RF), like a cordless phone, and comes with one finder fob and four tracking devices. Attach the tracking devices to your easily lost items by adhesive backing or key ring. Each tracking device measures 59.9mm x 40.2mm x 10.7mm and is color-coded and corresponds to a colored button on the finder. When an item goes missing, you press the colored button on the finder and the tracking device will flash and beep with a volume of 90-105dB. The signal will go through walls and cushions, but you’ll need to be within at least 60 feet of your lost item. The Click 'N Dig comes with extra batteries for the tracking devices. Choose from packages of two, four or six tracking devices. Price: $ 19.95 on ClicknDig for 1 tracker and 2 key fob tracking devices (check price on Amazon), $25.95 on ClicknDig for 1 tracker, 2 key fobs and 2 tags (check price on Amazon), $39.95 on ClicknDig for 1 tracker, 3 key fobs and 3 tags (check price on Amazon). If you're not keen on shelling out for new batteries every few months, the Esky Wireless RF Item Locator Key Finder has you covered. Just 10 minutes of charging will deliver up to 3 months of use and when it's time to recharge, the tracking device's LED light will flash to let you know. 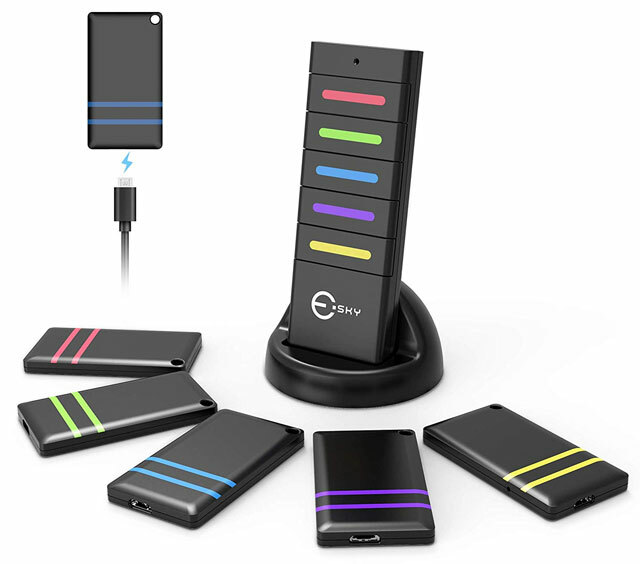 The Esky comes with five device trackers that can be stuck to your TV remote, laptop or whatever you want to track with the included velcro strips. The range on these is 50-100 feet, if you have a clear line of sight, according to the company. The tracking devices measure 53.3mm x 30.5mm x 4.6mm and have a built-in 85-90dB alarm. 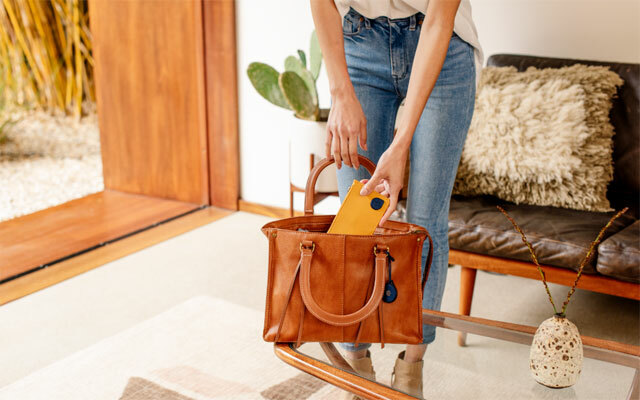 Tile Slim, Tile Mate and Tile Pro are great tracking devices that work with the Bluetooth functionality of your phone. Smaller and thinner than most other tracking devices, these Tile device trackers don't utilize a transmitter unit but are located via the app. When you get within 100 feet of the Tile Slim, 150 feet of the Tile Mate or 300 feet of the Tile Pro, you can ring the Tile-tagged device. There is no flashing light on the Tile but it will play an audible sound. The Tile Slim has an 88dB alarm, the Tile Mate is 1.5 times as loud as the Tile Slim, and the Tile Pro is 2 times as loud as the Tile Mate. And, if you double press the "e" on the Tile, your phone will ring with the Tile tune—even if you've turned your phone's ringer off. But what if you are out of range? That's where Tile products really shine. They will use every phone with the Tile app installed to search for your Tile tag. If someone else's phone finds it, you will be notified of its location and your private information is never revealed to the phone owner (it works in the background). It will also remember the last location it received from the Tile tracking device. The Tile Slim measures just 54mm x 54mm x 2.4 mm, which is thin enough to easily stash in your wallet. Because it's so thin, it has a built-in battery and needs to be replaced every year. The Tile Mate measures 34.7mm x 34.7mm x 6.2 mm and Tile Pro measures 41.6mm x 41.6mm x 6.5mm. Both have user-replaceable batteries. You can subscribe to Tile Premium service for $3 per month or $30 for the year, which covers all of your new Tile Mate and Tile Pro devices. Included in the subscription are automatic battery replacement, a 3-year warranty, shared tracking between household members for devices like remote controls and smart alerts. Smart alerts will tell you if you have left home without one of your tagged items. Looking to track your keys, wallet and other devices at once? Adero has you covered with intelligent device trackers that not only are in communication with your smartphone but also can "talk" to a subset of three smaller tags, called Taglets. So, you could put one tag in your bag and it could keep track of up to three other items. Want to make sure your water bottle, sneakers and headphones are in your gym bag? Adero has you covered. Just press the Smart Tag and it will light up green if all of your items are accounted for and red if something is missing. You can even set reminders to check that you have everything together in your bag before you head out. For instance, you might get a notification saying that your water bottle and gym bag aren't together 15 minutes before you'd planned on heading to the gym. Smart Tags are rechargeable, with the Smart Tags lasting 2 months per charge and Taglets last up to 2 years before they need to be replaced. Smart Tags measure 35mm by 4.2mm and are splashproof and Taglets measure 25.5mm x 3.4mm and are waterproof. If you just need to find your phone and the ringer is off, you can log into your Apple or Google account from any web browser (mobile or desktop) to make your phone ring. For iPhones, go to icloud.com and enter your Apple ID and password. Once you're logged in, select Find iPhone, choose your phone from the devices associated with your Apple ID and click on Play Sound. For Android phones, go to www.google.com/android/devicemanager and log into the Google account associated with your phone. Once you're logged in, select your phone from the devices associated with your Google account and click on Ring. Updated on 3/1/2019 with new tracker options and updated pricing. I’m by no means related to this product but Find’Em Tracking should be on this list. Can any devices help find a wallet or phone after they’re stolen? I know lots of phone apps now allow you to locate your phone, but would love something I could slip into my wallet if it’s ever stolen. Had a wallet stolen last year, it is one of the worst and scariest things ever. Would love a way to track down a thief and recoup my stuff, if it ever happened again. Hey there! Thank you for this useful article! I've been using Bluetooth Low Energy (4.0) to locate my lost keys. I had to replace a bunch of keys this week and winced at the cost and complexity of making spare car keys. Determined that I should never loose keys again, I bought a Bluetooth Low Energy “Key Keeper”, which has been beeping on and off all afternoon - the technology isn’t as mature on Android (4.4.4 on Nexus 4) as on iPhone. I’ll just leave the app logging where my phone was when it last saw the keys and I will hunt there using the blue tooth RSSI and a finger tip search, should the keys go missing. There are some apps like BlueScan on Android that put results of bluetooth scans on a public database. Once this technology becomes ubiquitous, that may be a good way of tracking down the current location of your lost things. The Tile App works great and has one of the largest communities out there. So, even if something I have gets lost, I am confident that someone else might be able to find it. I have three units that do not work! For over one week I have sent emails to track r bravo asking for help. I am going to file a complaint with the BBB and the state consumer affairs office. This is a terrible way to run a business. Dear people, don’t buy TrackR, don’t order it, never give money to them. I paid $320 for 30 pieces of Trackr Bravo in August 2014, now, 16 months later (! ), I have nothing, not even a proper answer to my numerous emails to them. I will write this on every internet wall I can, because this is a criminal act that should be prosecuted and the victims should get compensation. Is there a lawyer that can take over his case? I share your comments about the Bravo R Tracker. It took months and multiple emails to get my order. The devices burn through batteries in months. In fairness, the company sent me a set of replacement batteries. Overall, I would NOT recommend this device and very disappointed in it and the numerous positive reviews that are clearly in accurate. I can understand this device for bigger things like cell phones but never for keys. I am 97 and I never lose my keys. I made it a habit that my keys must always be in my hands or the car ignition, or in my back pocket or on the dresser in my bedroom. ever any place else. It takes about 3 weeks to create such a habit where you use your brain to force you to follow the habit. 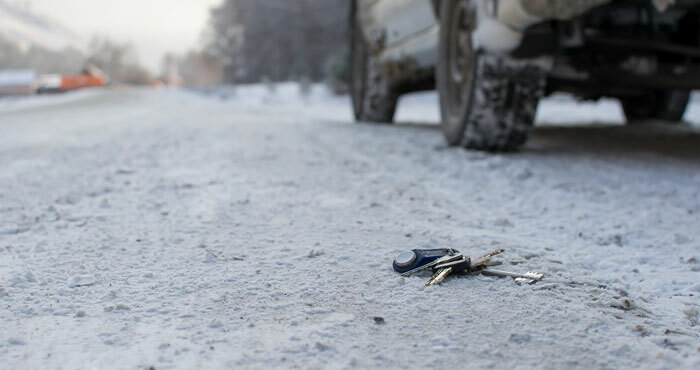 If you have your keys in hand and you are about (or tempted) to (temporarily) put them down on the kitchen table, your brain will bring it to your attention that it is a violation of your habit. Very cool that you’re 97 and never lose your keys! I tend to misplace things when I’m traveling because I’m out of my normal environs. You’re exactly right about it taking about 3 weeks to create a habit. Decades ago, I read that statistic (21 days), and the knowledge empowered me with the insight and patience to develop some habits. I might add, facetiously: One of the places for my keys is in my back pocket when I am not in the car. They are there almost of the time I am not driving whether I am at the computer or practicing on the classical guitar or watching TV or eating or wherever I am not driving or sleeping. As a matter of fact after sitting for a very long time, there is such a deep car key imprint on my rear that I can now unlock my car door with my rear end. Or, the keys may be in your back pocket in the washing machine. I have spent the last two days looking at tracking devices. I have read about all of the devices in this article at least three times and I find that they all have the same problems, which just about every other tracking device has as well. They don’t come with a master controller so you have to use a smartphone, tablet or computer with them. But even if the device will warn you if your about to walk away from it you can’t hear the warning if your smart phone is turned off, out of range, lost, or stolen. Oh! You say; but you can track it on the app on your smartphone, that has just been stolen. Well then press the button on your keychain and it will set off an alarm on the phone. Again the phone is gone, you can’t hear it, but the thief can, or for that matter anyone else who comes along and sees a shiny new smartphone sitting on the counter in the laundromat. Let’s face it, by now your phone is gone and there ain’t much chance that your going to get it back! Okay! If you must, design it with a fancy smart-app that I can use to track down my phone if I want. 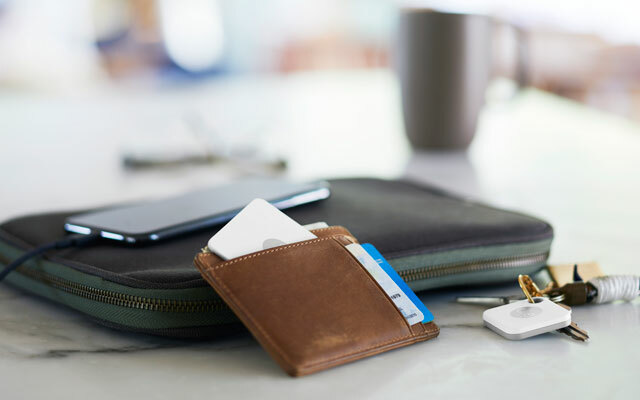 But what I really need is a device that I can carry in my pocket that can be linked to another similar device on any item that I don’t want to lose; Keys, Wallet, and yes a phone, smart or not. When I get too far from a linked device the one in my pocket starts beeping loud enough so I can’t help but realize that I left my wallet on the counter in the convenience store before I walk out the door. Why on earth do I have to have a smartphone to remember my wallet?! Thomas, you are dead on. That’s exactly what I have been saying. I have lost too many items (especially while traveling) where I have left my sun glasses, camera, or other personal items behind. While I appreciate solutions that helps you find the item, but by the time I realize its lost it is too late. Its gone, stolen, or hidden. I am looking for a tag system the is proximity based where I can configure it to set off an alarm if tag and sensor are more than x feet apart. Something like what the retail stores have. In all fairness not all Bluetooth tracking devices are equal. Most units when exposed to sand or water will have a life expectancy of minutes if not seconds. So what are the advantages of taking a $25 electronic device to the beach of vacation if there is risk? Some units are purposely designed with a one year life expectancy and require repurchasing a new unit after only 12 months. How does an electronic device protect you if it comes out of the box with built in obsolescence. The newest entry, Your Retriever over came these technical down falls and just keeps working. I guess I won’t be buying a smart phone any time soon. You just don’t get it until it happens to you. Your in a hurry, Distracted, mind somewhere else. It only takes a second for a thief to scoop up a phone and it’s gone! Then there’s the time it falls out of your pocket and you don’t realize it. Okay so pairing a smart phone and a proximity sensor could warn you but by then the phone or keys are gone, gone. What if the app fails? No warning! If each device links to every other device then they start beeping as soon as there too far apart! You don’t even have to have a smart phone to keep track of your valuables. just attach a tracking device to each valuable and boom, your set to go. If you have to pair the devices in a mesh you could use the internet, from any computer - or smartphone if you must! A well, maybe someone will snap some day! You mentioned Dogs in your opening remarks but no follow up. Within five minutes your dog can be a mile down the road or countryside or just visiting his friends next door. Is there anything that you can attach to the dogs collar and be able to visualy track where the dog is located? The only tracker I’d use for a pet would be a Tile, but it isn’t ideal for the reasons you cited. If you want real-time tracking, I’d invest in a Whistle 3 ($99.95 on https://www.whistle.com/). The device uses GPS for location and AT&T’s nationwide cellular network to communicate with your phone. You’ll need to pay a monthly fee of $6.95 - $9.95, depending on your contract term. But the Whistle 3 does come with a 90-day money-back guarantee so that should be enough time to asses whether it’s working for you.